To make a purchase to send to someone as a gift, simply enter the recipient's address as the Delivery Address. You will still have your address as the Billing Address, which is saved under your Payment Method. At this time, Deseret Book online does not offer gift wrap. To gift a Deseret Bookshelf Plus subscription, purchase a Subscription eGift Card here. You can specify the duration of the subscription you would like to issue on the eGift card. Please note that due to the nature of subscriptions, a credit card number will have to be used at the time of activating the subscription, even if a gift card will be used to pay for the subscription. At the time of activation, all of the available funds on the gift card will be applied to the subscription. At this time, it is not possible to send digital content (eBooks, audiobooks, digital music) as gifts. Only the person that purchases these items will have access to them. Currently, the best way to gift a digital item is to send a gift card and let them know what you had in mind. 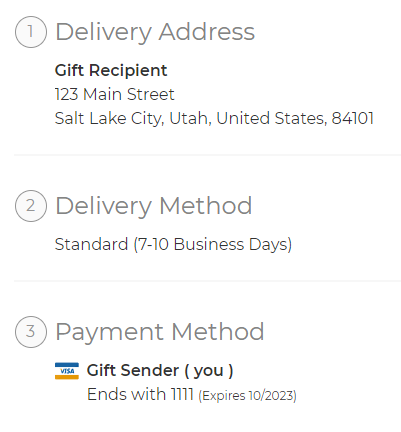 Deseret Book cannot refund purchases of digital products.